Egypt should not be a country where the only substantive political dialogue comes in the form of bloody attacks and mass death sentences. Egypt should not be a country where economic performance is measured by the number of hours when the power is on and months until stockpiles of grain run out. Egypt should not be a country ridden by class, generational and religious divides that have all but eliminated any true sense of living for a greater good. Egypt should not be any of this, but it is. It is tempting to wish all of this away, as many energetically tried over the course of the various "revolutions" of the past three and a half years, but the accumulation of over six decades of failure cannot be simply wished away. Flag waving, boisterous songs and hopes for miracle medical devices, however genuine, cannot substitute for nation building. Add to this the many disingenuous, inept and corrupt leaders presiding over a pliable and shallow body politic, and Egypt finds itself in the moribund state that it is in. But as bad as it is, it could be worse. With every passing violent day after every other passing violent day, Islamist retrogrades justifying the unjustifiable further discredit themselves and, in turn, legitimize the presence of the alternative. Whatever the shortcomings of that alternative, and there are many, they at least are not recklessly calling the country into jihad in Syria, Iraq or Gaza, or otherwise cunningly seeking to return the country to a fanciful age of religious bliss. Merely not being a terrible alternative is not much of an achievement, even if that alternative really is terrible. 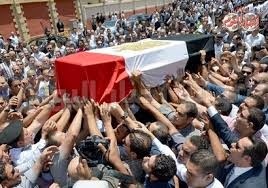 Egyptians deserve more than this, and its vibrant society will continue to demand more than this. The hope is that Egyptians, or at least enough of them -- leaders and citizens alike -- have matured sufficiently to approach the challenges lying ahead with more responsibility and sensibility than their predecessors.